If you have a lab coat laying around your home or you have recently purchased your child a doctor's set, you are in luck. 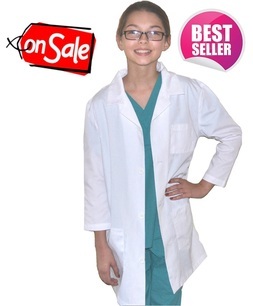 A simple white lab coat can provide hours of entertaining and educational play for kids of all ages. Today we'll share some inspirational ideas to get you started. The most obvious use for kids lab coats in play is to pretend to be a doctor. Instead of just relying on the lab coat and the doctor set, take this game a step further by pretending you are working in a real doctor's office. You could make a doctor's office out of a large cardboard box or just use your imagination. Arrange the chairs in your house so that the patients can wait to see the doctor. While you play with your child, you can teach them the names of the medical equipment and maybe grab some supplies from your home office (like a manila folder and a clipboard) and explain to them briefly about each patient having a chart and observing all of the problems that the patient has. This makes for a fun afternoon of pretend play that is also helping your child expand their language. 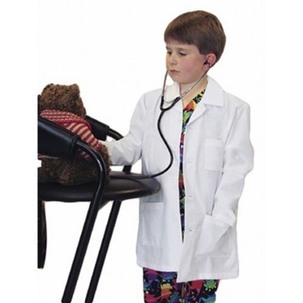 Another use for kids lab coats is for a veterinarian. If you have already played a doctor game or your child isn't interested in being a doctor, they may find it fun to be a veterinarian. Playing vet is easy for you because you can use some of your child's stuffed animals to serve as the patients. You can use a table in your home and cover it with some paper to use as an examining table. Take the role of the "vet's assistant" and follow your child's lead in pretend play. You could use the same vocabulary teaching method to help your child learn about terms used in a vet's office. Another fun idea to use a lab coat for is to be a scientist. You could preface this activity by reading an age-appropriate story together about scientists and explain to your child how they sometimes work with doctors. You can have your child wear their lab coat as they help you make scientific projects like slime! New vocabulary to learn in this activity could include words like solution, solvent, and beaker. Today we've shared three ways you can incorporate kids lab coats in pretend play. Anytime you engage in pretend play you are helping your child learn and grow at home, even if you may not realize it.